Quote: "Someone started this and it was really funny... It's kind of a funny idea... but maybe we were the first zombie movie - and we looked good." Olivia Newton-John is amused by theories her Grease character Sandy was dead throughout the film after drowning at the beginning of the movie. Quote: "I think I would be afraid to do an impression of her because I just love her so much. I just went to Las Vegas just to see her in concert and I met her and it was very exciting. I asked her, 'Will you please pose with me like you're on an 1980s sitcom poster?' And she did!" Comedienne Kristen Wiig on meeting her idol Olivia Newton-John for the first time. Fact: Olivia Newton-John has taken a 'selfie' photograph with her movie alter-ego Sandy from 1978 musical Grease. The character has been immortalised as a waxwork by Madame Tussaud's Hollywood, and the actress attended the unveiling in Las Vegas, where it will go on display for a week before being shipped to Los Angeles. Quote: "We've always wanted to do something else; John has an idea for a musical project and we're working on it now." Olivia Newton-John teases fans about plans to reunite with her Grease co-star John Travolta. Fact: Olivia Newton-John and John Travolta's Grease duet You'Re The One That I Want has been named the best-selling movie track in the U.K. Love Is All Around, covered by Wet Wet Wet for Four Weddings And A Funeral, was runner-up. Quote: "As mother of the bride, I am looking forward to helping Chloe plan the many aspects of her wedding, and just being there to help her make it the day she and James envision for themselves." Olivia Newton-John can't wait to see her daughter Chloe marry martial artist James Driskill. Fact: Singer/actress Olivia Newton-John is set for another movie musical role after signing up to play a hockey mum in an indie film. The Grease star will be a big part of Score: A Hockey Musical. She'll play songwriter Marc Jordan's wife in the film and the duo will collaborate on a song for the project's soundtrack. Fact: Olivia Newton-John will belt out her 1981 hit Physical with Julie and Julia actress Jane Lynch on an upcoming episode of hit U.S. TV show Glee. Quote: "I can still wear them. But they're locked away in a cupboard. I only bring them out for special occasions - my husband loves them!" Olivia Newton-John can still squeeze into the tight costumes she wore in GREASE. Quote: "I have seen one when I was very young. It was unidentified and it was flying. It's true, I'm intrigued by them." 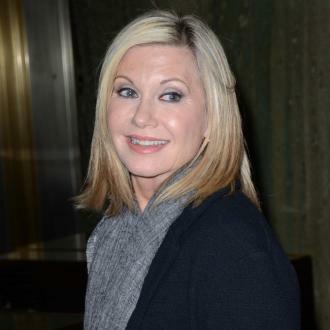 GREASE star Olivia Newton John if fascinated by the possibility of UFOs. Fact: The private detective Courtney Love has commissioned to investigate her alleged fraud claims was hired to track down Olivia Newton-John's missing ex-boyfriend Patrick MCDermott in 2006 by U.S. news show Extra. John Nazarian is one of Beverly Hills' top private investigators. Love has hired his services in a bid to clear her name in an ongoing dispute with bosses at American Express, who claim she owes them $350,000 (£233,333). Fact: Country music singer Martina McBride revived the memory of rock and roll legend Elvis Presley on Wednesday (03Dec08) when she sang alongside a 1968 video of the star performing holiday tune BLUE CHRISTMAS on U.S. show Good Morning America. MCBride overdubbed vocals to create the duet for new album Elvis Presley Christmas Duets, where the King is paired with singers Carrie Underwood, AMY GRANT and Olivia Newton-John. Fact: Olivia Newton-John's new husband JOHN EASTERLING saw GREASE for the first time onboard the new Qantas A380 airbus' test flight, which was piloted by John Travolta. Fact: Australian singers Keith Urban and Olivia Newton-John are teaming up to record a track for the GREASE actress' forthcoming LP. The pair will collaborate on a song for OLIVIA NEWTON-JOHN + FRIENDS: A CELEBRATION IN SONG, which will help raise funds for cancer charities. Fact: Dannii Minogue's new album CLUB DISCO will feature a cover of Olivia Newton-John's hit XANADU. Fact: A statue of the late crocodile hunter Steve Irwin has been unveiled at his zoo in Queensland, Australia. GREASE star Olivia Newton John and the country's prime minister John Howard were among those to pay tribute to the TV star who was killed by a stingray last year (06). Fact: Sharon Osbourne, Anastasia and Olivia Newton-John are among the cancer survivors headlining a new TV special about the killer disease. The trio is among the celebrities taking part in Frosted Pink, which will air in America on 14 October (07) and benefit various cancer research charities. Fact: Dionne Warwick, Pamela Anderson and Olivia Newton-John will join Michael Jackson at the 25th birthday party of Brunei's Prince Azim in an English country home this weekend (26May07). Fact: Olivia Newton-John and Andrew Lloyd Webber are hoping to boost US TV talent show YOU'RE THE ONE THAT I WANT after signing on as judges. The reality show seeks to find the leads for a new revival of stage musical GREASE. Quote: "We called it the Lenny Bruce and SNOW WHITE tour." Billy Joel recalls his mid-1970s US tour with Olivia Newton-John.